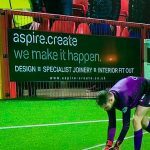 Aspire.Create is a universal interior fit out company that specialises in design, manufacture, fit out and project management of full shops & refurbishment contracts throughout the U.K and Ireland. 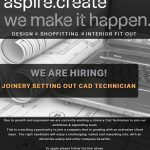 We have over 30 years’ experience within the shopfitting and bespoke joinery industry and currently produce all our own joinery items in our in-house workshop. Whether your project is a refurbishment or a multiple branch roll out, we have skilled and highly experienced teams that can deliver effectively and efficiently on time and within budget. As part of our dedication to meet and exceed our client’s expectations, from concept to completion we will give you the best advice, expertise, service and quality. We will also take the hassle out of dealing with multiple contractors as we can do it all, we offer our clients the exclusive service of a bespoke turnkey fit out package specifically tailored to suit their requirements. We promise a dedicated approach to each client and their individual project. We will listen to our clients and we will design and build their project to suit their requirements. We ensure a trusted, reliable, consistent and personal service. We guarantee projects of a superior quality at a competitive cost on time and on budget. You will have a dedicated project manager and supervisor controlling your project.